As far as the literary world is concerned, Neil Gaiman is a god among men. Does he deserve the title and the hype? Oh yeah. He’s that good. I haven’t read many of Gaiman’s books for children, other than I suppose Stardust (but I don’t really think it’s for kids). I’ve been excited for this book since before it came out. I just loved the idea of it and it didn’t disappoint. I was a bit surprised that it turned out to be a book of short stories, joined together by a common plot, setting, and cast of characters. An interesting way of doing things, but one I enjoyed. Gaiman is such a good writer and like good writers, can kind of get carried away with the sentence spinning and the plot turning. This book was much more manageable in that regard. Easy to follow and no less beautiful or artfully crafted. The plot twist that comes in the second to last story (the chapter before the end) made me gasp out loud. I was not expecting that and just the way it was dropped into the turn of a simple sentence…genius. Between the period of one sentence and the capital letter of the next, the whole game changed. I do wish the plot surrounding the death of Bod’s family and why the man Jack is still trying to kill Bod had been better explained. It was summed up rather quickly (in about a paragraph) and left me unsatisfied. I think there was so much room to go there that wasn’t really delved. Yes, I know it’s for kids, but still. Just one paragraph more. 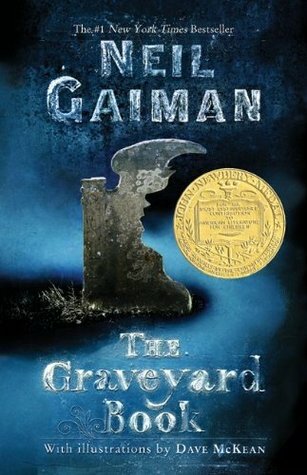 If you’ve never read a Neil Gaiman book before, this is a great place to get your feet wet. Imaginative, beautiful, funny, bittersweet…without the density of the thicker books like American Gods.